Sliders are miniature cheeseburgers, although in my formulation, I omitted the cheese. For the buns, you can either make your own (which I've done before, but it's too much work), or grab dinner rolls and slice them in half. Ground turkey is used for a healthier alternative. It's a slight tweaking of a March '07 Bon Appetit Recipe. - 24 small potato dinner rolls, cut in half. Mix the first 11 ingredients together. Sautee in skillet ~3-4 minutes per side, depending on thickness. Lightly brown dinner roll halves in skillet, with butter. 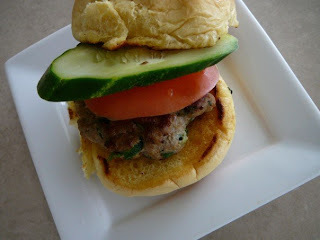 Assemble sliders, top with favorite toppings.